Sydney, Australia, The Opera House. I love this picture, but this is one of those photos I’m sure my son, Eddie, will look back at and go, “Really, Mom? Why did you dress me that way…what were you thinking? !” We actually hadn’t meant to have him wear the Down Under shirt. We had limited clothes that we were wearing in Sydney because we didn’t yet want to disturb our massive suitcases that we packed for our year-long adventure in Adelaide. Eddie, who was 4-years-old at the time, did not want to pose for the photo in the first place. He did, however, like the orange color of this shirt that we had purchased for him the day before. 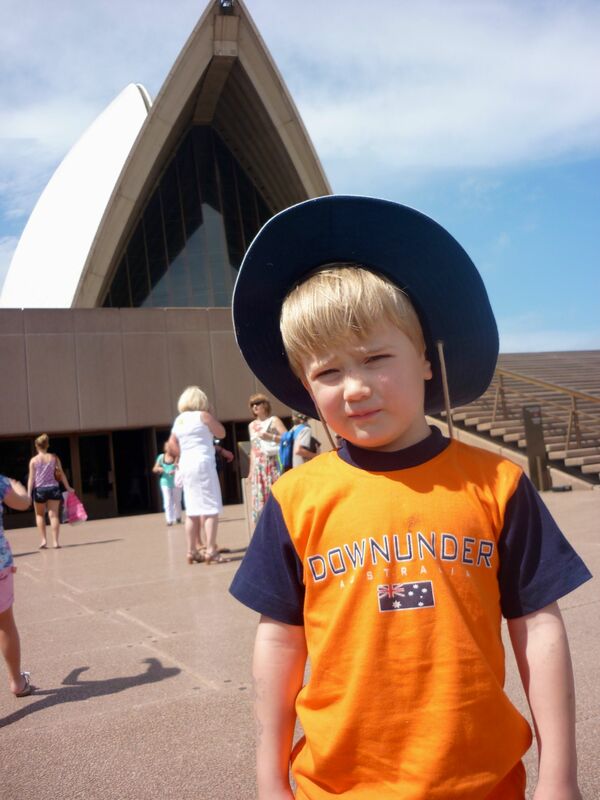 This entry was posted in Australia, Humor, Unfortunate Photos and tagged American tourist in Australia, awkward photo, Sydney Opera House by stephglaser. Bookmark the permalink. That reminds me of an episode of The Graham Norton show, that featured Hugh Jackman. Mr. Jackman discovered that here were a few Australians in the otherwise British audience. He stood up, said “have a look at this” to the host of the show and shouted “Aussie, aussie, aussie” at the top of his voice. Instantly the Australians in the audience replied in unison with a very loud “Oi, oi, oi”. I was very impressed, even more so since it was my first introduction to that phrase. Haruko-chan (sorry I thought I had responded to your comment already!) Yes, it’s crazy how it is this reflex chant. Very impressive. My son began saying “oi” as a general response to something he liked and then I knew he was becoming Australian. Thanks for the comment! Isn’t that the role of the parent, to take photos that they will hate one day.